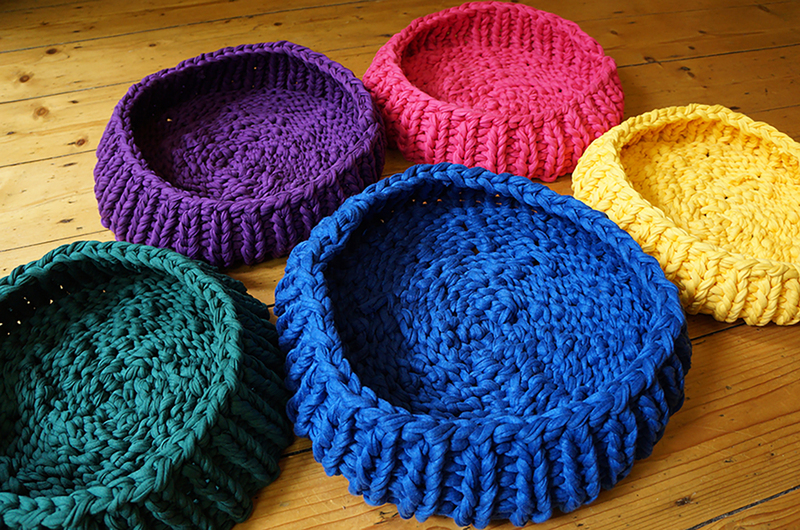 Mad Cat Baskets are finally here! Whew! It’s taken me long enough to finalise this design, but here it is. 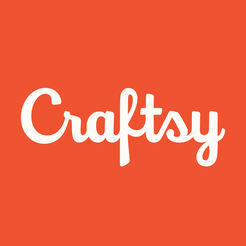 Listed and live on Etsy and Not On The High Street. I’ve even updated my profile to show them off. After getting to grips with the quirks of t-shirt yarn, I’m really enjoying working with it. 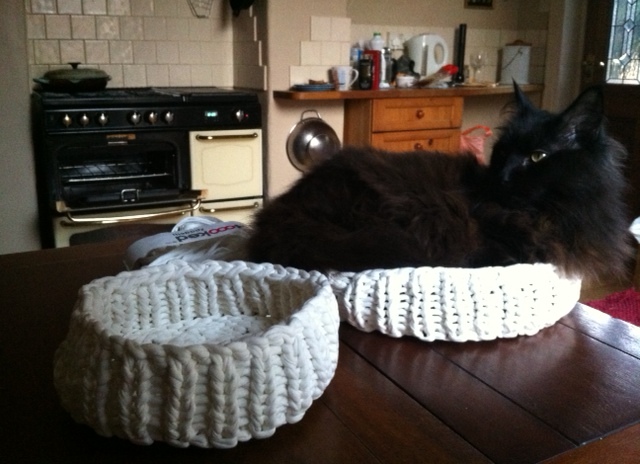 Many, many hours of working and reworking and unpicking and re-calculating have gone into these five cat beds. 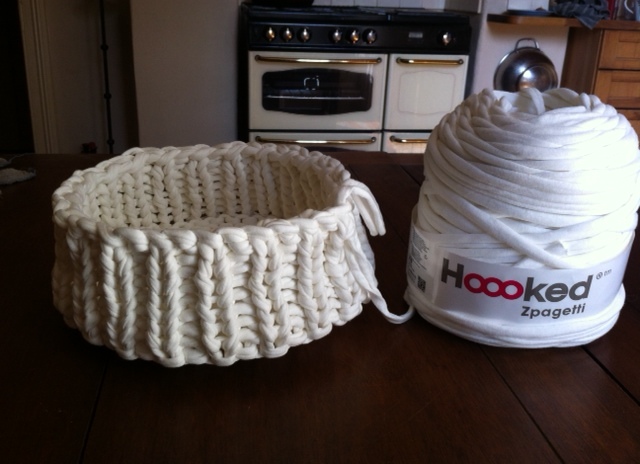 Because the yarn is totally unreliable – could be super-chunky, or just a bit chunky – each basket comes out a different size. But they will all comfortably accommodate a small or medium-sized cat. And Herbie, at a push. 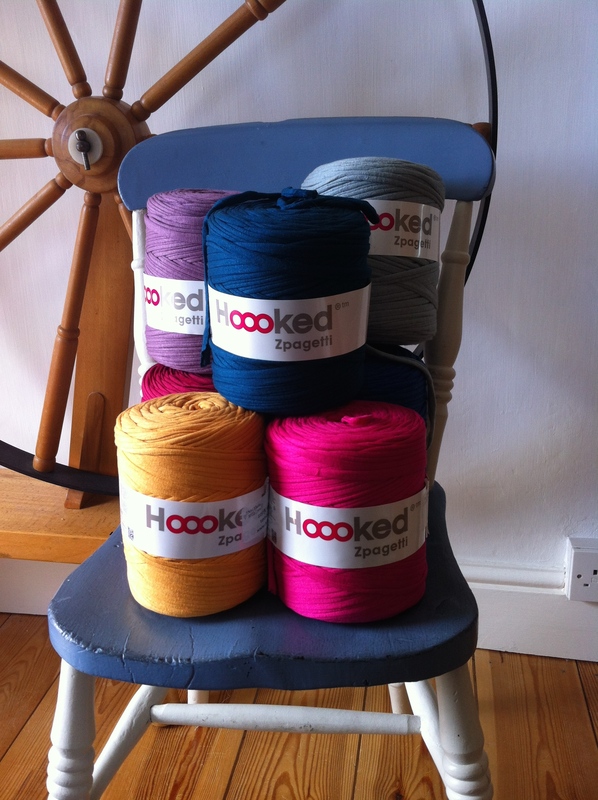 Some fab new colours have arrived from Hoooked Zpagetti. and a yellow one. But Herbie has chosen purple. I love the bright colours and how the light makes the giant stitches pop out. More colours coming soon – and a cat cave! 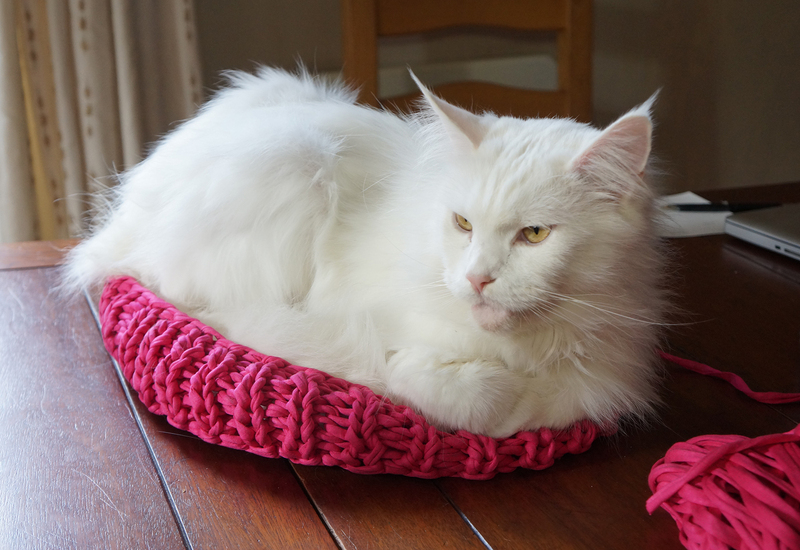 How about a shocking pink knitted cat basket? I think so! 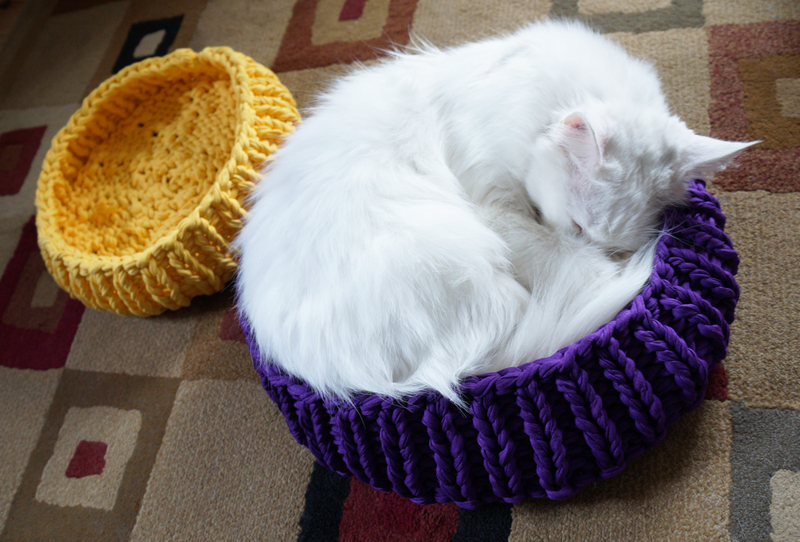 The basket is normal-cat-sized. It’s just that Herbie is BIG. Still, he’s happy to model for me. 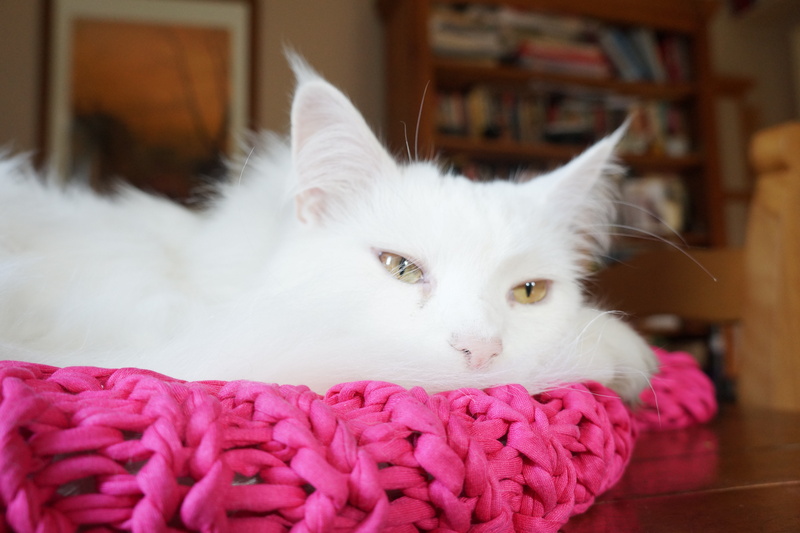 The pink basket is going to be part of my new range of cat beds in all the colours of the rainbow. I’m using upcycled t-shirt yarn, and it has many little quirks. One of them is that each cone of yarn is a slightly different thickness. Which means that every time I start a new basket, I have to assess the thickness of the yarn and decide whether to use a double strand or not. On the plus side, the range of colours is glorious and never-ending, so inspiration is never far away! 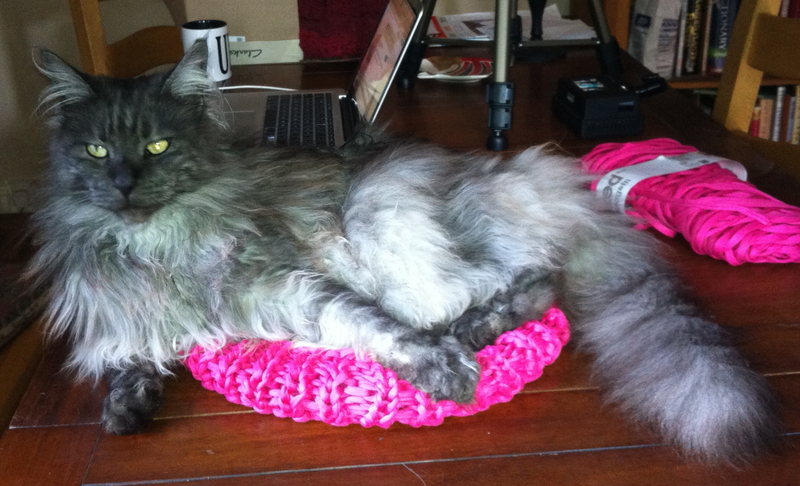 Oh, and Monty likes the pink basket too. But he kind of flattens it. 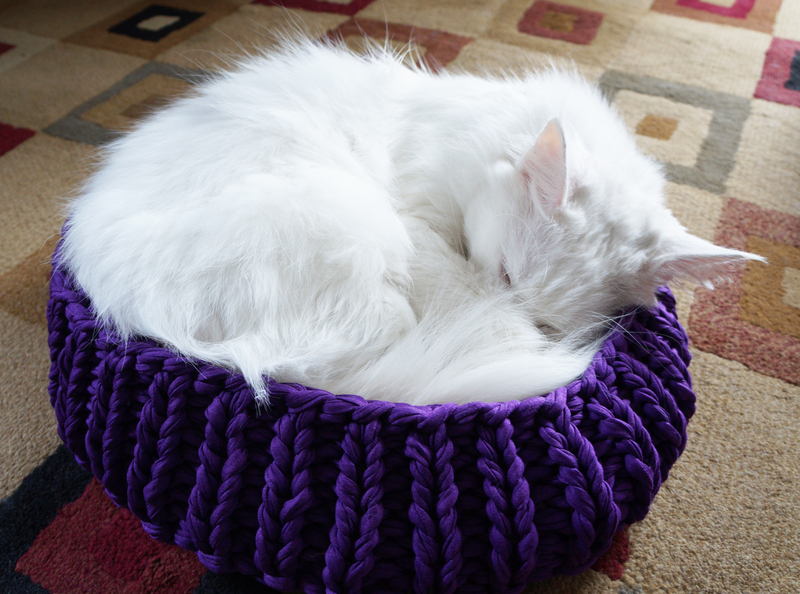 I knitted my cat basket in t-shirt yarn. It turned out much better than I expected. I have had this cone of t-shirt yarn on the shelf for more than 6 months. I never thought it would work. T-shirt yarn is quite floppy, not stiff like the semi-felted wool I was using before. That’s why I thought it would never work as a basket – the sides have to stand up unsupported. But I was wrong. The sides stand up beautifully. Until Larry came along and curled up on top of it. It was good to get Larry’s seal of approval. But I have to make an adjustment. The new yarn is thinner than the semi-felted wool, so the basket knits up smaller. 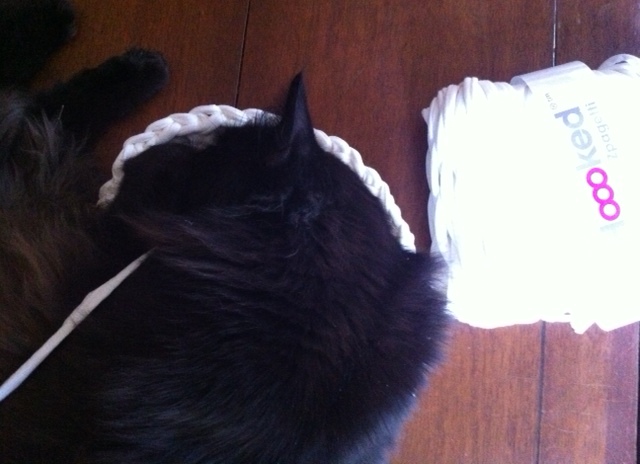 Larry is using the entire basket as a pillow. Time to make a bigger basket. Here goes with the next size up. I’ve got just enough t-shirt yarn left to make the medium size. This works out a lot better for Larry. The t-shirt yarn is delightfully easy to work with, maybe because of the generous stretch it has. Fortunately I can use the same set of doublepins I already have. 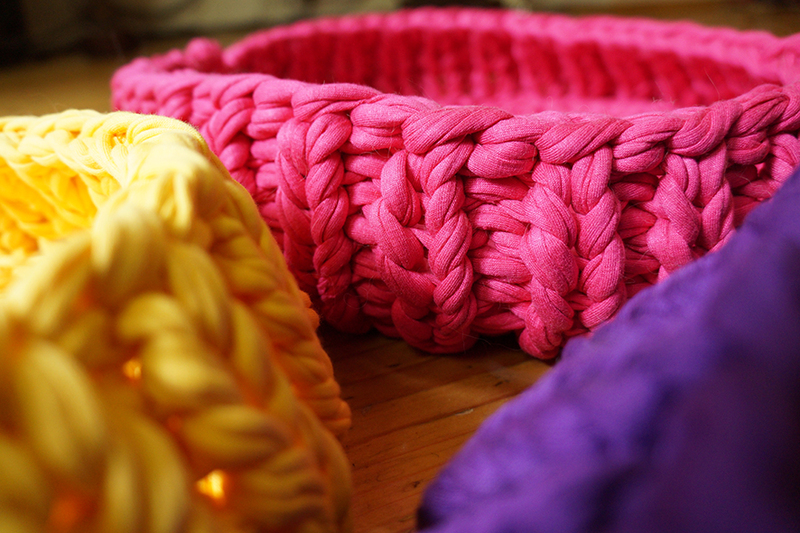 Most exciting of all, t-shirt yarn is easily available in every colour under the sun. Wow, how exciting is that? 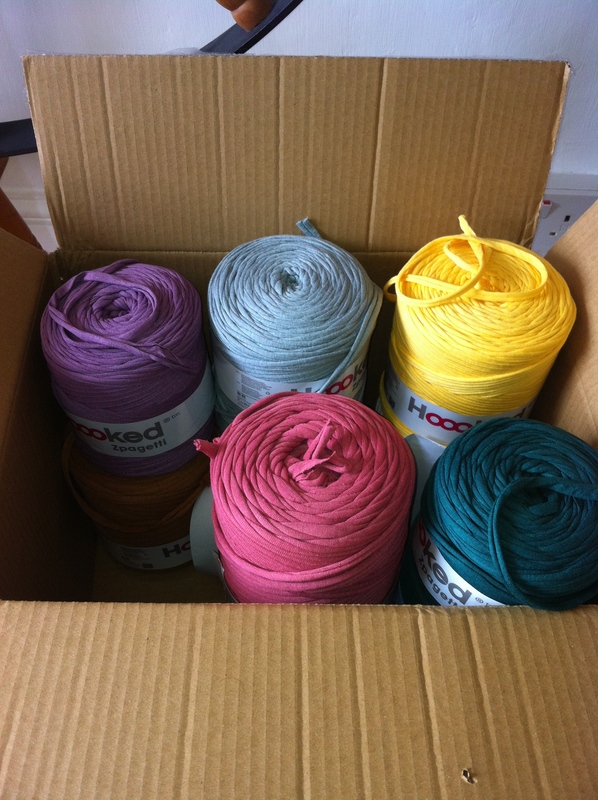 I went online and ordered a load of fabulous colours. 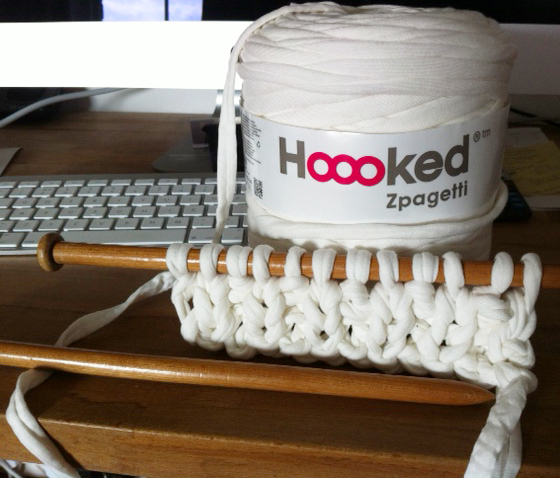 Knitting – me and you are back on! Such a long time since I picked up the needles. Crazy busy few weeks in the day job since January. I had the pleasure last weekend of knitting a bamboo flute warmer for a musician friend. The size was 60 cm long by 3 cm diameter. 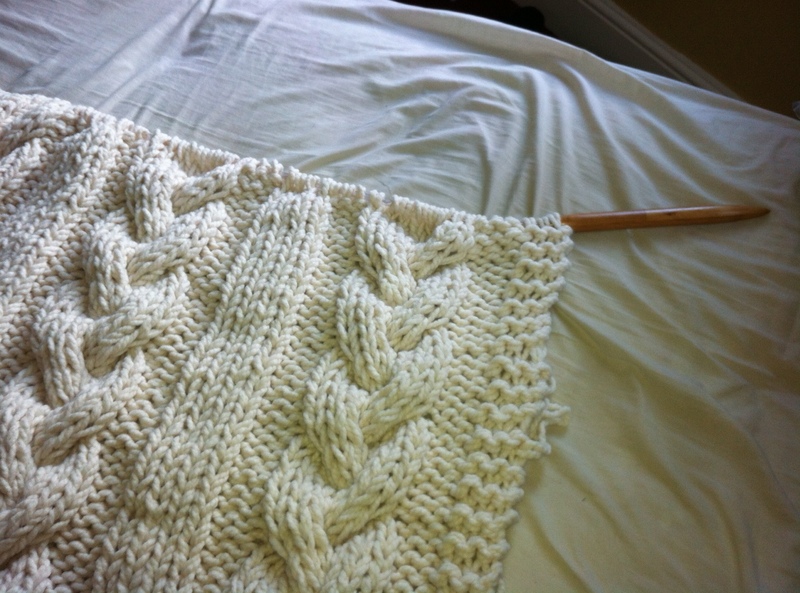 So I knitted a long, long rectangle, eyelets at one end, and sewed it up. I added a double ribbon drawstring and a few beads. It was simple and quick, and my friend loved it. I thought, how I’ve missed knitting! Now I have a few days off the day job and some space in my head for other things. 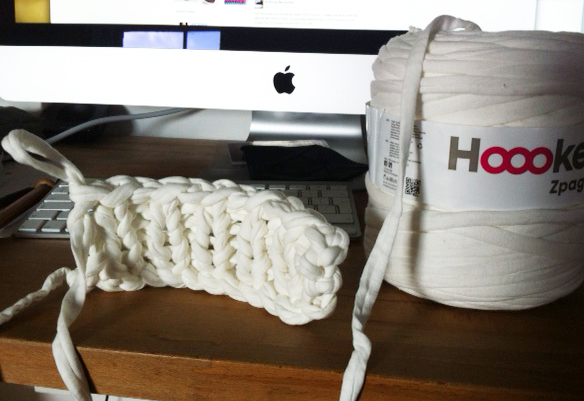 I finally got the t-shirt yarn out which I ordered ages ago, and cast on using 12mm needles. It looks OK! But does it stand up? I see potential. Could this be the start of a new range? 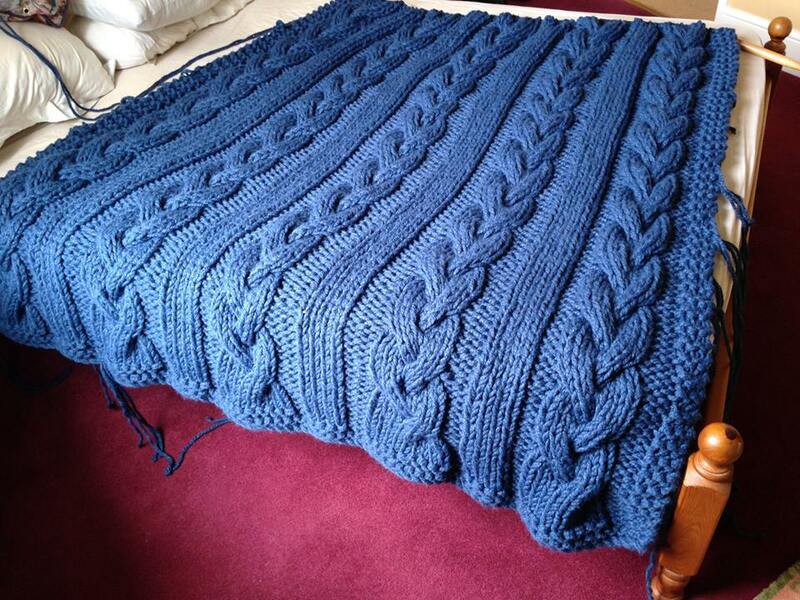 I’ve just completed an order for my biggest ever extreme knitting Cable Knit blanket. This is for a queen sized bed, so it measures 200 x 150 cm. I’ve never made one this big so had to work out the pattern repeat to achieve that size. I used my 24mm circular needles, which were handmade by my Uncle David. I don’t have a 24mm cable needle, but for stitches this big, I don’t really need one. I can just use my thumb or forefinger. This kind of knitting is not exactly portable. 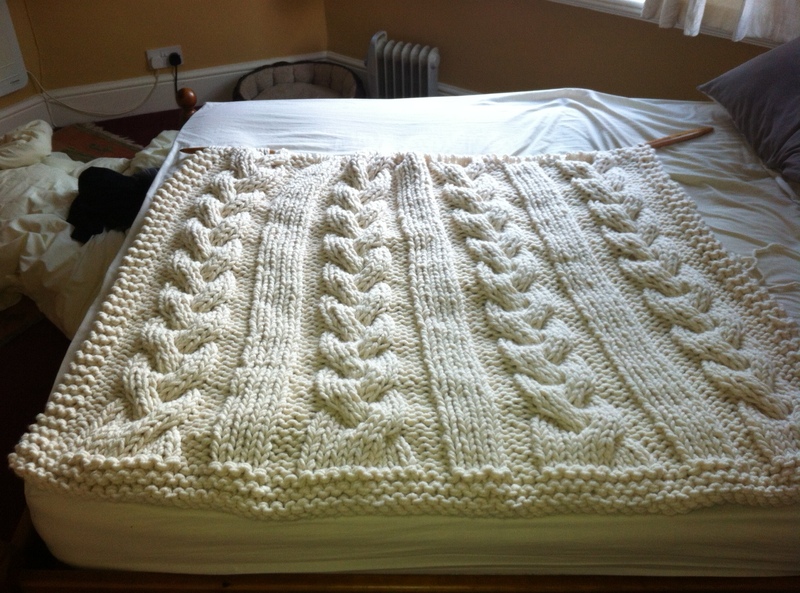 I knitted it into a big box and the finished blanket weighs 4kgs! 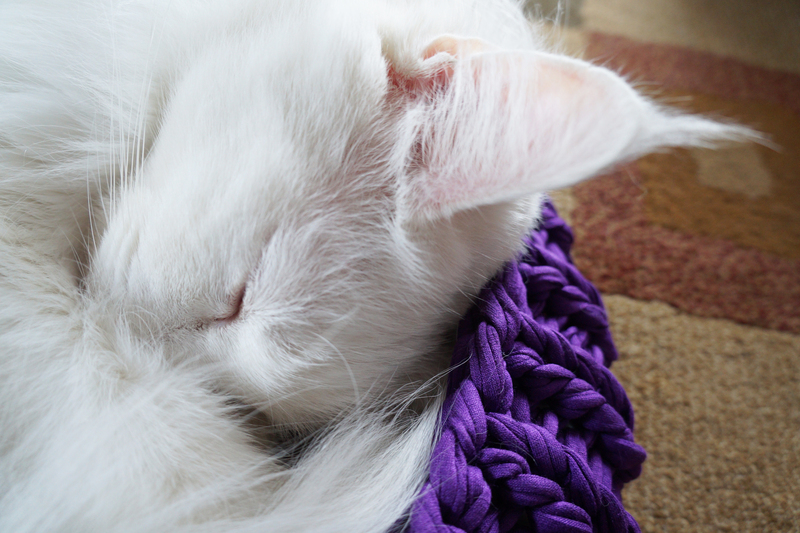 I’ve knitted quite a few of these blankets now in various colours. Mustard yellow, grey, and pink. But the most popular colour is this cream. That’s it for Christmas orders now. Time to relax and enjoy the season!